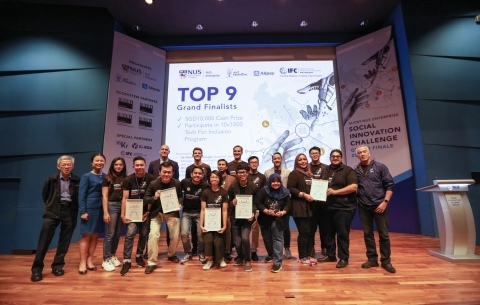 The Alipay-NUS Enterprise Social Innovation Challenge (“Challenge”), jointly launched by Alipay, the world’s leading payment and lifestyle platform, operated by Ant Financial Services Group (Ant Financial), and NUS Enterprise, the entrepreneurial arm of the National University of Singapore (NUS), today announced Indonesian start-up Aruna as the grand finals winner. Aruna was chosen based on its use of digital technology to help fishermen in Indonesia improve their livelihoods through better market access and fairer trading opportunities. Most of Indonesia’s 2.7 million fishermen live under the poverty line and contributed 25 percent to the national poverty rate, the Antara news agency reported this month, citing data from the country’s Marine and Fisheries Ministry. By connecting fishermen and potential customers through Aruna’s online platform, the start-up is able to dramatically reduce transaction costs, helping the fishermen raise selling prices by as much as 20%, while buyers can pay up to 15% less. Aruna has served 1,701 fisherman groups in 16 provinces. “We are very excited. This is the first time we have won international recognition for our work. We will next work on further growing our team and help more fishermen out of poverty,” said Farid Naufal Aslam, CEO of Aruna. Aruna will receive a total of S$60,000 as the grand finals winner, while the other eight finalists from Singapore, Malaysia and Indonesia will walk away with S$10,000 each. These nine start-ups will also be given support from NUS Enterprise, Alipay, special partner International Finance Corporation (IFC), and other supporting partners of the Challenge, to further develop their ideas. In addition to the cash prize, the winner and all other finalists will benefit from the 10x1000 Tech for Inclusion programme, jointly established by IFC, a member of the World Bank Group and Special Partner of the Challenge, and Alipay. The comprehensive training programme supports the cultivation of 10,000 technology experts in emerging markets from both public and private sectors over the next 10 years. Since its launch in October 2018, the 10x1000 programme has conducted preliminary surveys to optimise its training modules and has hosted a number of training and exchange activities. The winner and all other finalists will also receive mentorship and incubation support from NUS Enterprise for a period of three months, as well as access to its BLOCK71, an ecosystem builder and global connector community with co-working spaces in Singapore, Bandung, Jakarta, Yogyakarta, Suzhou and San Francisco. Operated by Ant Financial Services Group, Alipay is the world’s leading payment and lifestyle platform. Launched in 2004, Alipay currently serves over one billion users with its local e-wallets partners. Over the years, Alipay has evolved from a digital wallet to a lifestyle enabler. Users can hail a taxi, book a hotel, buy movie tickets, pay utility bills, make doctors appointments, or purchase wealth management products directly from the app. In addition to online payments, Alipay is expanding to in-store offline payments domestically in China and internationally. Alipay’s in-store payment service covers over 50 markets around the world, and tax reimbursement via Alipay is supported in 35 markets. Alipay works with over 250 overseas financial institutions and payment solution providers to enable cross-border payments for Chinese overseas travellers and overseas customers who purchase products from Chinese e-commerce sites. Alipay currently supports 27 currencies.